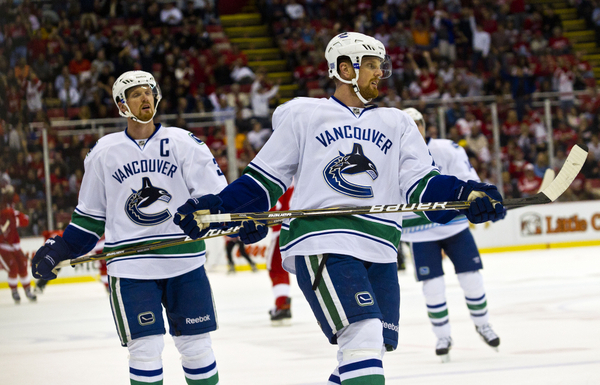 Daniel and Henrik Sedin have been mainstays for the Canucks ever since Brian Burke’s draft day coup ensured that the brothers would have the opportunity to play together in the National Hockey League. Throughout the twins long tenure in Vancouver, it has frequently been difficult finding a line mate to complement the talented Swedes. The first winger to really mesh with the Sedins was Anson Carter, who had a career year when being fed by Daniel and Henrik, scoring 33 goals in 2005-06. Carter foolishly left the cozy confines of the Sedin line the next year for a contract in Columbus, and he only scored 11 more NHL goals in his career. The most success of any Sedin third wheel has been accumulated by Alexandre Burrows. 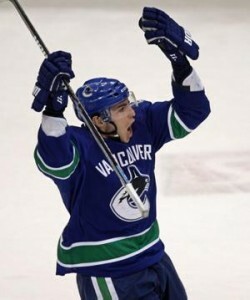 Burrows averaged 27 goals per season from 2008-09 to 2011-12 while playing primarily with the Sedins. Burrows went from the ECHL to being an NHL grinder to emerging as a legitimate goal scorer thanks to his ability to capitalize on the Sedins’ creativity. Burrows success as a goal scorer motivated Vancouver to try to move Burrows back to a line with Ryan Kesler and find another lucky soul to benefit from playing with the twins. It looked like Zack Kassian might be next in line, but his suspension at the beginning of the season and lack of consistent play has precluded him from full time top line duty. The failure to find a strong replacement might have pushed Vancouver to reunite Burrows with the twins, but unfortunately a string of untimely injuries has left Burrows mostly on the injured list this season, with Burrows managing only seven games so far in 2013-14. This has resulted in a merry-go-round of players trying to fill the role on the Sedins right wing. Ryan Kesler had good success early in the season, but Coach John Tortorella recognized the need for Kesler to anchor the second line, and he was returned to that role. Newcomer Mike Santorelli has also been given a chance, and he has played well in spurts for Vancouver, and his success has been one of the biggest (and most welcome) surprises of the season. Jannik Hansen also played with the twins for a longer stint this season, but the grinder has not developed as a bigger scoring threat while playing with the twins. “The Great Dane” has scored eight goals so far this season, which is in line with his performance the last couple seasons. Tortorella has gone so far as to split up the twins at times during the season to gain a spark from his team. This approach has worked in the short term, but clearly the twins are best when playing together, with a third man to help fill the net. A terrible first period by the team in its game Friday night against the St. Louis Blues. The Canucks managed only five shots on the goal in the first period (on home ice), and they looked lethargic and slow. As Tortorella will frequently do when the team is struggling, he juggled the lines and moved fourth-liner Zac Dalpe up to play with the twins. The move came as a surprise to everyone, including Dalpe, who has been living in exile on the fourth line all season (with a few games in Utica for good measure). Dalpe has averaged about six minutes per game this season, a typical amount for a Tortorella fourth liner. 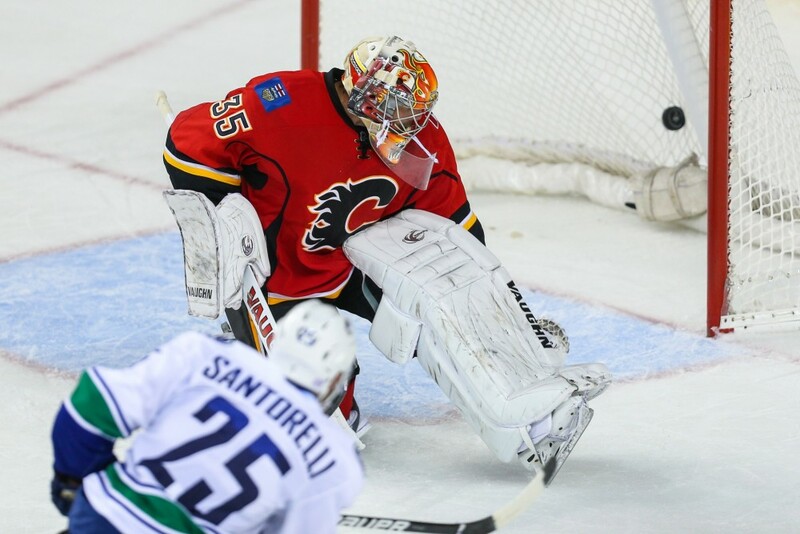 The change paid dividends for the Canucks as Dalpe did exactly what you are supposed to do when playing the Sedins: he got in front of the net with his stick down and waited for the puck to come his way. Daniel obliged, and Dalpe redirected the puck behind Brian Elliott to open the scoring. The Canucks went on to beat the Blues 2-1 for a much needed win the hyper-competitive Western Conference. Dalpe finished the game with more than 14 minutes of ice time and was 6 of 9 in the faceoff circle. Dalpe came to the Canucks toward the end of preseason in a trade with the Carolina Hurricanes. Dalpe and Jeremy Welsh came to Vancouver in exchange for minor leaguer Kellan Tochkin and a fourth-round pick next year. The trade did not result in a lot of parade planning in B.C., but it did add some depth to the team’s roster of forwards. Dalpe spent most of the last three seasons with the Charlotte Checkers, Carolina’s AHL team, and he put up some solid numbers, averaging around 20 goals and 23 assists. With Burrows returning soon from his latest injury soon, it seems unlikely Dalpe will spend an extended stint on the first line. But it does look like he will continue in that role tonight when the Canucks take on the Los Angeles Kings. Vancouver needs all the secondary scoring it can get after the Sedins and Kesler. Hopefully Dalpe can continue to contribute to the team, on whichever line he ends up over remaining months of the season.